Heat treat ovens are very common in the heat treat industry and are commonly referred to as Companion Draw Furnaces or Draw Batch Furnace. Hartley Corp. offers 40 standard SDB heat treat oven models. Four (4) temperature ranges. Standard maximum continuous temperature ratings are 800°F (425°C), 1000°F (540°C), 1250°F (675°C), and 1400°F (760°C). Each SDB heat treat oven model can be heated by either a direct gas fired burner (Natural or Propane), or with electric heating elements. We can also provide indirect gas fired units if required. When specified, the equipment can be designed to meet even the most stringent standards (i.e. AMS-2750, AMS-2770, or BAC-5602, to name a few). The standard furnaces are designed to accept the most common heat treat oven baskets and load sizes (please reference chart). If your basket size isn’t listed, please contact us so we can discuss your application. Wisconsin Oven’s draw batch ovens feature heavy duty construction, which includes a plate steel outer shell, a reinforced steel plate oven front, a lined inner shell, and exterior structural reinforcements as required. The following chart shows a breakdown of these components by maximum temperature rating. Wisconsin Oven’s heat treating ovens also include combination air flow through the work chamber, a pier rail hearth, disconnect switch and NEMA 12 controls. We offer a wide variety of standard options to satisfy most applications, including special temperature controllers, chart & paperless temperature recorders (as well as other data acquisition equipment), process timers, and 7-day timers. 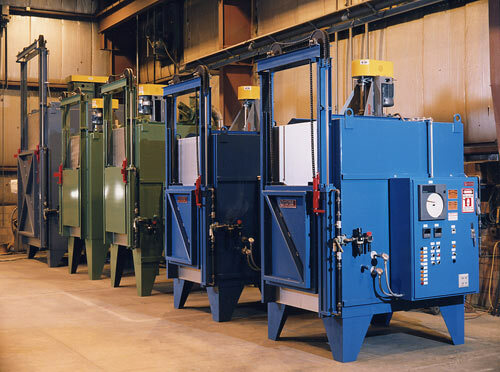 Our heat treat ovens can be supplied with Quench Tanks or powered or non-powered load tables. Traveling loaders (as shown below) are also available. Many different hearth designs can be supplied with our equipment. As a standard, we provide a pier-rail hearth, which is used when the baskets or products are loaded either by hand, or by fork truck. Other hearth designs we offer as options include: full width rollers, split roller, wheel or roller rail (with or without chain guides). Hearths are available in either carbon steel, stainless steel, or alloy, depending on the temperature and your needs. We can design the equipment with a bridge and chain guides, to allow loading and unloading from an existing charge car.